Worldstream Review 2019: Is Worldstream a Good Hosting? In business since 2006, WorldStream is a Netherlands-based web hosting provider specializing in unmanaged dedicated server solutions. They serve customers from all over the world including the United States, Germany, China, and Spain. WorldStream has been in the dedicated server business for over a decade. Since 2006, they’ve specialized in offering highly affordable unmanaged dedicated server packages and colocation services. They’re based in the Netherlands, but serve customers from all over the world including the United States, Germany, China, and Spain. WorldStream’s dedicated servers are classified into four primary categories: premium, custom, unmetered, and special deals. They also have dedicated servers hosted in Curaçao to cater to their Latin American clientele. All servers are housed in highly secure data centers based in the Netherlands and built according to Tier III specifications. This means that should any single device stop working, a second one will kick in to ensure that your servers remain online. They utilize uninterruptible power supply units which have over 99% efficiency. Plus, their backup 800kVa generators ensure that if their energy suppliers’ power is cut out, they still have the electricity to keep the servers running. Every dedicated server comes with a minimum of 5Gbit/s DDoS attack protection. The DDoS Shield algorithms automatically detect the most common DDoS attacks and can detect any attacks within a single second. Further, their smart DDoS NOC technology will review any attacks after the fact so as to continually improve their attack detection and prevention systems. If DDoS attacks are a huge concern for you, you can choose to upgrade to a maximum of 100Gbit/s DDoS protection. 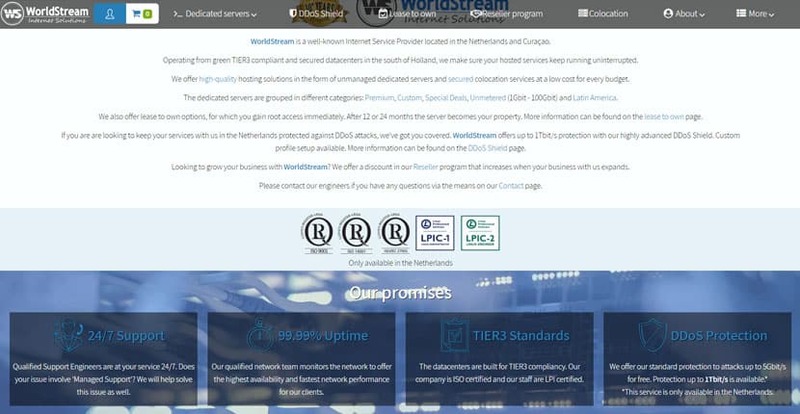 User reviews of WorldStream have been somewhat hit or miss: many users report excellent uptime, server speeds, and connectivity, but there are also quite a few that have had negative experiences with the host. WorldStream does invest quite a bit into their hardware, however, so the variance might be due to the need for more specialized server management personnel. Given that they specialize in unmanaged dedicated servers, you do need quite a bit of technical knowledge to get started with WorldStream. Alternatively, you can hire a server management company or tech support team to do so. If you require emergency technical support for a server fault, WorldStream can avail you of their services, but this will come at an additional cost. Since WorldStream specializes in only one thing, they’re able to offer these at nearly unbeatable prices. Most of their dedicated servers are priced lower than the market average. Best of all, you can customize any dedicated server you choose, and the servers can be upgraded or downgraded at any time. All dedicated server packages are unmanaged, which means support is minimal: they focus on getting them configured and set up for you quickly, but thereafter you’re on your own. That said, if you do encounter any problems and you suspect the issue is on their end, they’re fairly responsive during office hours. You can reach them via their live chat, telephone, email, or the contact form on their website. In my experience, they respond to most queries within half an hour. They’re also fairly active on web hosting forums and will check in on customer sentiment from time to time, though of course, that isn’t the best way to reach them for customer support. Wondering how Worldstream stacks up against other Web Hosting companies? Enter any other Web Hosting company and we will give you a side-by-side comparison.